How Is Our Neighbourhood? A Study of Community Engagement, Connectivity and Provision in Tallaght West. This study is based on consultation with three core stakeholder groups: residents in Tallaght West; young people in the area, and those working (paid and unpaid) in the community. Mixed methods were undertaken including surveys and Focus Groups, with the former being undertaken by local residents. Overall, feedback about living and working in Tallaght West is positive, with community spirit, sense of belonging and strong local connections all being cited as area strengths. There is also a small but consistent proportion of respondents who do not share these experiences, and for whom the neighbourhood is not a safe or welcoming place. There are no clear factors influencing these very different responses. Finally, there are similar dynamics amongst service providers and residents in terms of capacity to impact on decisions. The latter report limited involvement in their communities and do not feel they have the opportunity to change the environment; whilst the former express dissatisfaction with management approaches and suggest a disconnect between front line experience and high level decision making. Title: How Is Our Neighbourhood? 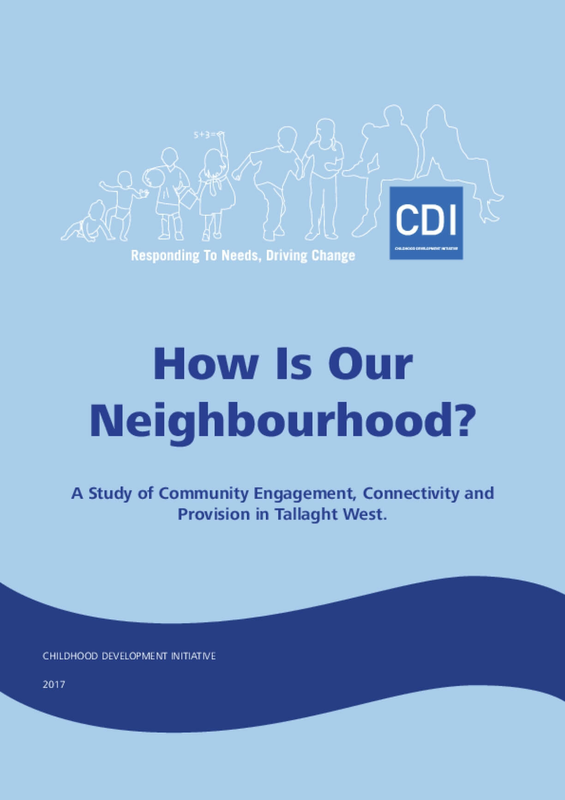 A Study of Community Engagement, Connectivity and Provision in Tallaght West.